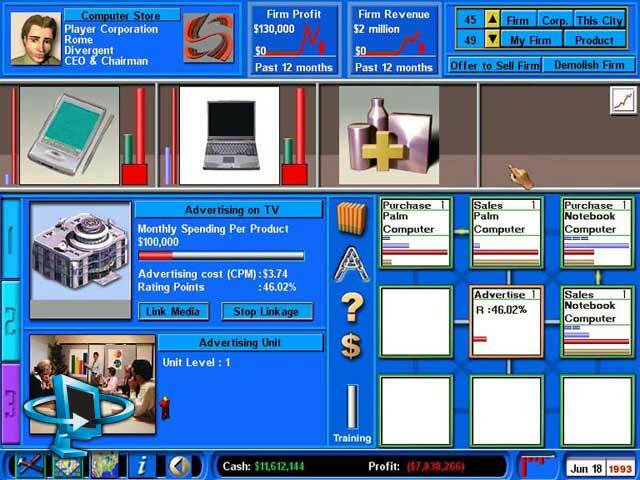 In 1995, headed up by Trevor Chan, Enlight Software developed the greatest business simulation of its time: Capitalism. In 2002, with Trevor Chan still at the helm after their long endeavor with the Seven Kingdoms series, Capitalism II is a reality. It is a game of inexplicable proportions. While not by any means technologically advanced, Capitalism II puts you in command of a worldwide business empire that must purchase, manufacture, sell, and advertise its products in a variety of ways. Most businessmen in the real word specialize in one area such as stock analysis or accounting. In Capitalism II, you must assume all of these tasks and do them efficiently in order to succeed. You can easily become immensely wealthy or watch billions go down the drain in just a couple of years. Just as in all other great games, there is more than one way to win. 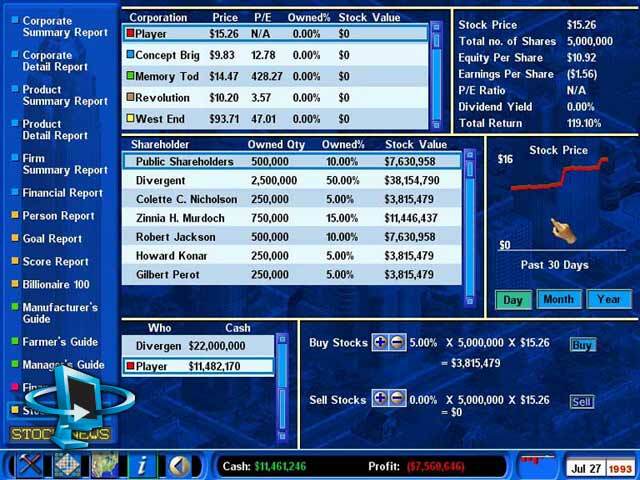 You can play the stock market, investing in each of the corporations present in the game. You can focus on one specific area of the market, such as livestock products. Or you can diversify, delving into computers, health care products, apparel, and so on. Do you want to fool around with real estate, farming, mining, drilling, and R&D? Capitalism II gives you that chance. It is so perfect in its realism that it is used in business education. You will have the opportunity to micromanage retail stores and factories, as well as hire people such as a Chief Technical Officer, a Chief Operating Officer, and a Chief Executive Officer to do some of the tasks for you. As if you couldn't tell already, I'm in awe of how much they have crammed into this simulation and made it fun at the same time. I can see many of you scoffing at the thought of this as entertaining. But may I remind you that this title goes for the measly price of $20? Come on. Give it a chance.